I love discovering brands that are made in Canada or the US. The story behind Westward \\ Leaning is no different. They launched in San Francisco in 2012 with a simple idea: "To make products that are equally beautiful and meaningful. Our premise is that social causes and progressive issues shouldn’t just be an afterthought, or a marketing pitch. Instead, they should be an integral part of everything from the product's design to how we use its proceeds." Pretty great, right? Each pair of their sunglasses carries its own unique story. 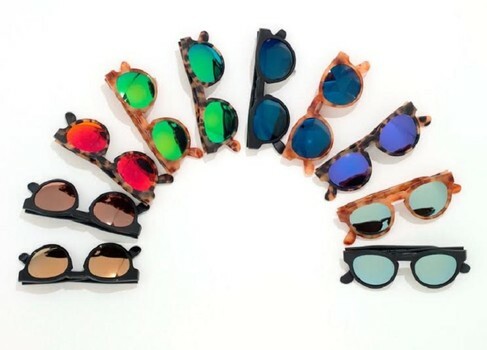 They have a team of artisans and jewelers handcraft each pair of sunglasses using traditional techniques. They cut, weave, sew, and sand the frames’ unique accent materials before they are inlaid in their frames by hand. By hand! Loving the special touch they put on each pair. It's no wonder these sunglasses are seen on so many celebs. Gimme please! What a fun product! It's always great to find new products and brands you haven't heard of before. This looks like a great place to buy sunglasses!